Add a Realspace folding table to your home or office to create a sturdy temporary workstation or storage area. Need more open space? Simply fold the table up and store it until its needed again. Paint and permanent marker can be removed without damage to the top. It is also dent, scratch and rust resistant. Lightweight, impact-resistant design folds easily for storage. Steel frame is built to last for years. Automatic gravity leg locks make it easy to take it out of storage and erect it on your floor. Non-marring foot caps protect the floor from scrapes. 29) high. 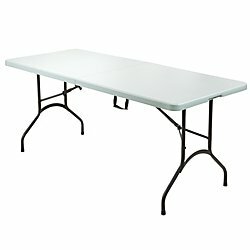 5, 6, and 8 tables have a 1,000 lbs. weight capacity (evenly distributed load ). 60in. Round table supports upt to 250 lbs load capacity (evenly distributed). Granite finish. Meets and/or exceeds ANSI/BIFMA performance standards. Backed by the manufacturers 10-year limited warranty. 6ft. fold-in-half table offers an expansive work surface. This fold-in-half folding table takes up minimal space when not in use. Weight capacity tested to support up to 250 lb. Greener choice - contains 35 recycled content. Backed by the manufacturers 1-year limited warranty.